Just Jingle: Make It Happen! Today is the official release day for Tami Mayberry's brand new Take Note set! I showed you a fun card using these great stamps last week and today I want to show you one that is a bit outside of the box for this fun set of stamps! For this one I took a note from Miss Amy Tsurata. She's always using fun tags in creative ways on her cards, so I thought I'd give it a shot! I'm no Amy, but I think it turned out rather fun! You might have noticed that there is no rainbow in the Take Note set. Nope. There isn't. BUT...there IS a nice, straight line stamp. A line stamp? You say? Yup. A line. A straight line. AND...when you get the clear stamps you can manipulate that line to be anything you want it to be! I used it several times in different colors to create a child-like sketch-style rainbow! TOTALLY FUN! 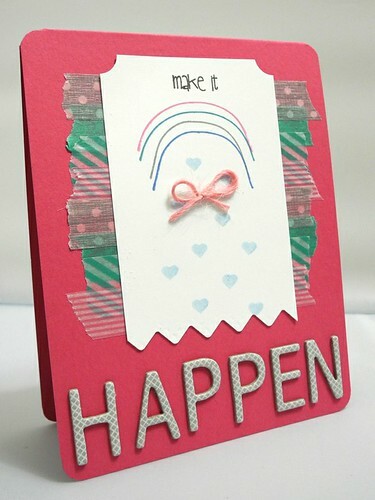 I used the small heart stamp for my 'raindrops' and stamped the 'make it' portion of the sentiment at the top of the tag before adding the 'happen' portion with Thickers. AND...there is even more Take Note inspiration today coming from the Gina K and Tami Mayberry Design Teams! You can check it all out over on Tami's blog! so gorgeous, love how you used the washi! 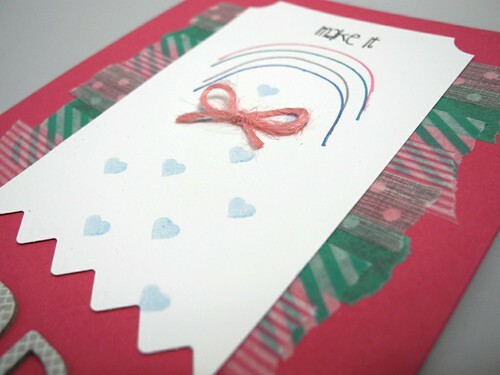 I think your card is very pretty Love the bow! cute! How clever to use that line stamp to make rainbows. Lots of possibilities there! There is only one word that comes in mind when seeing this card: awesome... or great... or beautiful! Well that would be 3!